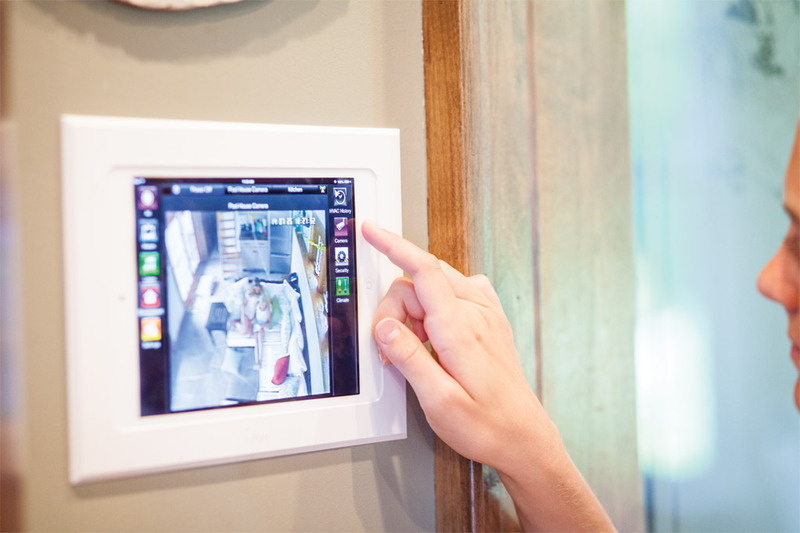 As Mikki Abraham directs her home-security system to allow a visitor in the front door, she simultaneously checks on her four daughters at the backyard pool and turns down their music—all from the iPad affixed to her kitchen wall. Each of the six-member Abraham family in Orono uses the new connected entertainment and security system differently—personalization is the name of the game today—and it doesn’t take a tech background to make it rock. Cutting-edge home technology is letting homeowners live a connected, comfortable, convenient life they could not have imagined 10 years ago. The Abrahams just replaced a 2006 system, including a “prehistoric 400-disc unit,’’ dad Chad says, with a top-drawer Savant system designed for their wants and needs by Residential Technology Systems (ResTech) in Plymouth. The choices for their upgrade were influenced by their tech-savvy daughters, ages 9 to 15, three of whom have iPhones, plus speakers in each of their bedroom ceilings. Julia, 13, listens to her music library every day, she says (it helps when she cleans her room). At the same time, Remy, age 9, can relax in a beanbag chair in her room and stream a Disney movie on an iPad. “It’s great: They each have their own devices, and there is no fighting,’’ Mikki says. While the girls don’t have TVs in their rooms, there are 10 in the house, plus a luxurious home theater with a 100-inch screen in the basement. This system streams whatever they want, whenever they want it, from iTunes, Google, Netflix, and other Internet services to the theater screen, or to any of the TVs, phones, or iPads. The look of these new wireless systems is more streamlined and less visually intrusive than the systems of the past. The boxes, cables, and speakers that used to clutter rooms are gone. Many systems are housed in a mechanical room, out of sight. They are also easier to service; the installer often can fix the problem remotely. And it’s not just entertainment systems. Home security; heating, ventilation, and air conditioning (HVAC) control; lighting systems; and home appliances are all part of the mobile orientation in home automation. Homeowners can check on home systems from a smartphone to make sure that there is no water in the basement or that the air conditioning is on. Chad Abraham says he will now check his pool house HVAC during the winter because the pipes froze and caused damage before he had mobile access. The systems alert homeowners when something is amiss, before it becomes a major problem. 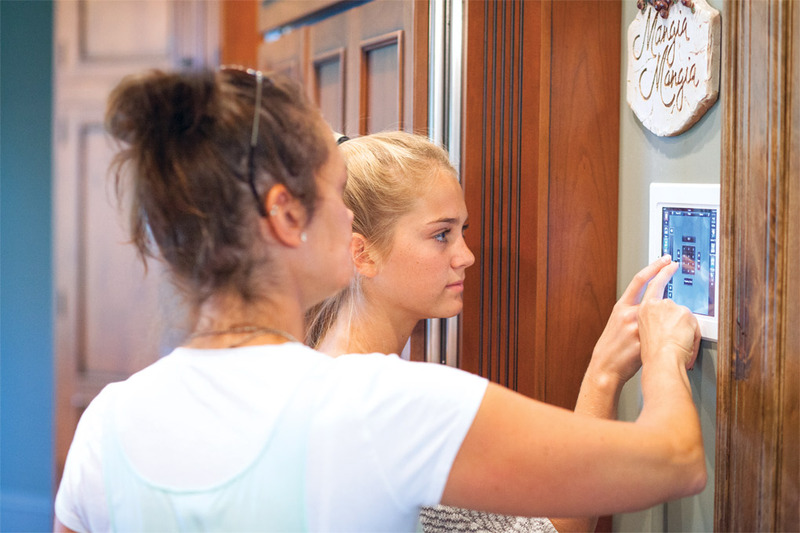 Connected systems are now part of the norm in the home industry, and custom builders and remodelers say they are here to stay. Tech options are given in high-end homes, says Matt Cooke of OSLO Builders. Even clients who are not tech aficionados insist that builders install wiring for future use and resale value. “Tech people love it and will spend extra for it, and even non-tech clients find they love the convenience of it,” he says. As home technology evolves, so does its share of new-home budgets. Lance Anderson, co-founder and president of Admit One, home automation and cinema specialists in Edina, says a basic system costs a few percentage points of a high-end home’s value. “For 5 percent, they get more audio, more TVs, and automation,” he says. “It’s not uncommon for us to see 10 percent of a home’s value on a full automation system.” ResTech’s Schwandt says a million-dollar-plus home requires a minimum budget of $50,000 to get a solid system installed. A fully monitored security system that links your home to a company that keeps an eye on it 24/7 rings up at $10,000 plus. Streaming content now costs between a few hundred and a few thousand dollars per room, so many people decide they want access in almost every room. Media rooms have largely replaced home theaters due to streaming, both Anderson and Schwandt report. What other home-tech options are trending in the Land of 10,000 Lakes? “Outdoor sound is getting huge here,’’ Schwandt says. While not everyone wants an outdoor TV, most want audio, Anderson says: “We have cool products, disguised fixtures, that fit into the landscape instead of those old fake rocks’’—and they deliver superb sound. People are more willing to spend on things that make their life more convenient, accessible, and safe, experts agree. It’s now simple to learn how to use smartphone apps and iPad controls, and really be in command of your home’s technology. “My 4-year-old has no problem running the systems in our house; she shows the babysitter how to use them,’’ Anderson says.